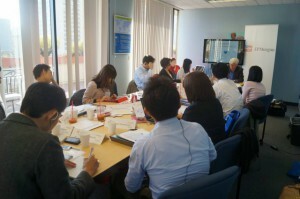 TOMODACHI NPO Leadership Study Tour is a two-week long leadership program that provides up to ten grassroots NPO leaders with the opportunity to travel to the United States to meet with American NPOs and NGOs in order to network and learn best practices. The primary goal is to help strengthen and expand the effectiveness of small grassroots NPO and NGO organizations in Japan by teaching skills related to capacity building and leadership development in order to create a stronger more vibrant NGO sector in Japan. The 2013 TOMODACHI NPO Leadership Study Tour was a two-week leadership program that took place in San Francisco, California and Seattle, Washington from October 27 – November 9, 2013. Ten NGO/NPO leaders were selected to learn about capacity building, funding, and increase their management/leadership skills in order to help create a stronger more vibrant NGO sector in Japan. Utilizing the knowledge and best practices gained from this program experience, each participant returned to Japan with an individual plan of action that he/she created to improve specific areas of his/her leadership skills or organization’s capacity.